55,000 people are trapped without aid in Rukban Camp in southern Syria. The camp is inside the Tanf deconfliction zone, effectively under US-UK Coalition military occupation. As an Occupying Power, the UK has a LEGAL DUTY under the Geneva Conventions to ensure the population are able to receive food and medical aid. The UK is failing in its legal duty under the Geneva Conventions. Today we are sending MPs a full illustrated briefing (PDF) explaining the circumstances and the UK’s legal duty to the population. Please write to your MP and call on them to end the UK’s failure in Rukban. An aid convoy from Damascus to Rukban has been cancelled. UN aid from Damascus is subject to approval by the Assad regime. Rukban is on the Jordan border. UK ally Jordan blocks cross-border aid. 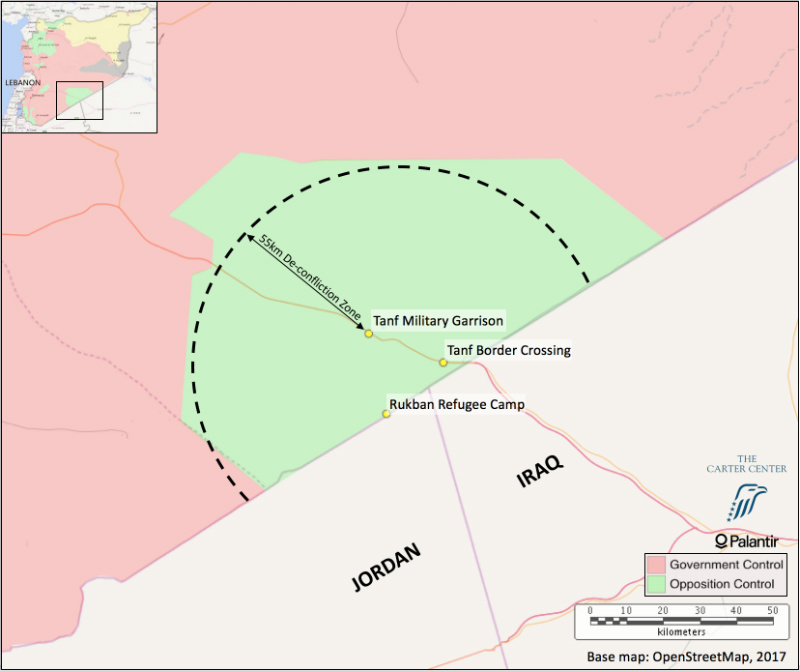 Rukban is inside the Coalition’s Tanf zone. The zone is patrolled by a local force trained by the UK and US, and is defended by the RAF. As an Occupying Power, the UK has a LEGAL DUTY under the Geneva Conventions to ensure that the population can receive food and medical aid. Given the UK role in defending the Coalition’s Tanf zone, why is the UK failing to meet its obligations as an occupying power under Geneva Conventions towards the thousands of civilians trapped in the zone? Have ministers instructed the Royal Air Force to draw up plans for airlifting humanitarian aid to civilians trapped inside the Tanf deconfliction zone? Have UK officials discussed with Syria Civil Defence their offer to help provide aid to civilians trapped in the Tanf deconfliction zone? The UK has a legal duty towards civilians in the ‘de facto besieged’ camp at Rukban. Rukban camp is located just inside Syria along the border with Jordan. The camp began forming in late 2014 after Jordan closed its border to most asylum seekers. Jordan has severely restricted aid access to the camp since a June 2016 ISIS suicide bomb attack on a Jordanian border post. In the last three years, tens of thousands of people have fled to the camp from areas targeted by Russian and Coalition air strikes. At least 55,000 people are at risk in Al Rukban refugee camp, the Union of Medical Care and Relief Organisations (UOSSM) reported this month. There are 150 cases in urgent need of medical care, and 15 people have died this month alone, among them two babies who died from malnutrition and lack of medical access. This human suffering is taking place inside a military zone defended by Coalition forces, including by the Royal Air Force. Rukban Camp is inside the Coalition’s Tanf deconfliction zone. The zone is patrolled by Syrian forces trained by the UK and US, and is defended by the Royal Air Force. In Spring 2016, Syrian opposition forces captured the nearby Tanf border crossing from ISIS. Shortly after, UK, US, and Norwegian special forces established their base at Tanf. In August 2016, BBC News reported on UK Special Forces at Tanf base, training local Syrian forces to fight ISIS. Since then, US and UK forces have defended an area with a radius of 55 km around Tanf base both against ISIS and against pro-Assad forces. As recently as June 2018, a Royal Air Force Typhoon fighter jet dropped a 500lb laser-guided bomb during a firefight with pro-Assad forces. The Tanf zone is effectively under military occupation by UK and US forces. Consequently the UK and US have legal duties to the population within the zone under the Geneva Conventions. Syria Civil Defence (AKA the White Helmets) have declared their willingness to enter Rukban camp to assist civilians. Maghaweir al-Thowra, the local forces trained by the UK and US, have declared they are ready to provide security for aid deliveries. The UK has the capacity in the Royal Air Force to airlift aid into the Coalition’s Tanf zone. Any UN aid from Damascus is dependent on facilitation letters signed by Assad regime authorities. 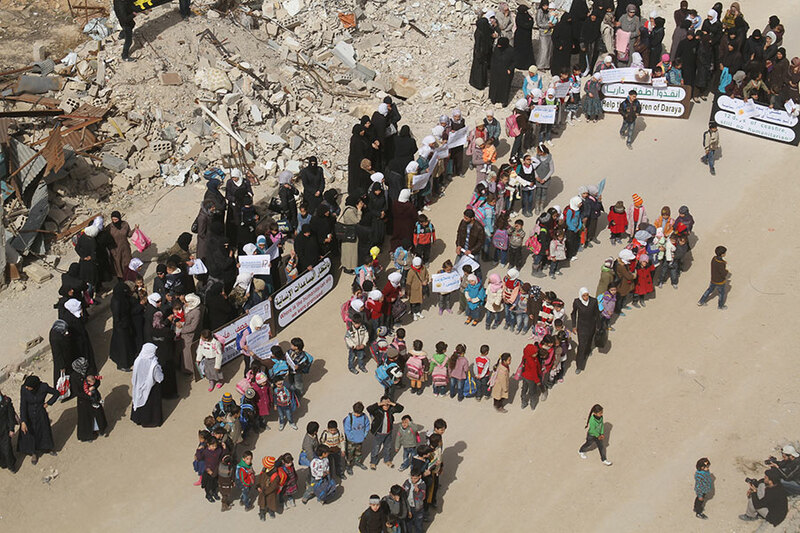 The Assad regime has routinely blocked UN aid to areas outside regime control. The Assad regime insists such facilitation letters be signed by Jamil Hassan, head of Air Force Intelligence, a man sanctioned by the UK and EU and subject to an international arrest warrant issued by Germany’s Federal Prosecutor for his part in the mass torture and killing of prisoners in Syria. 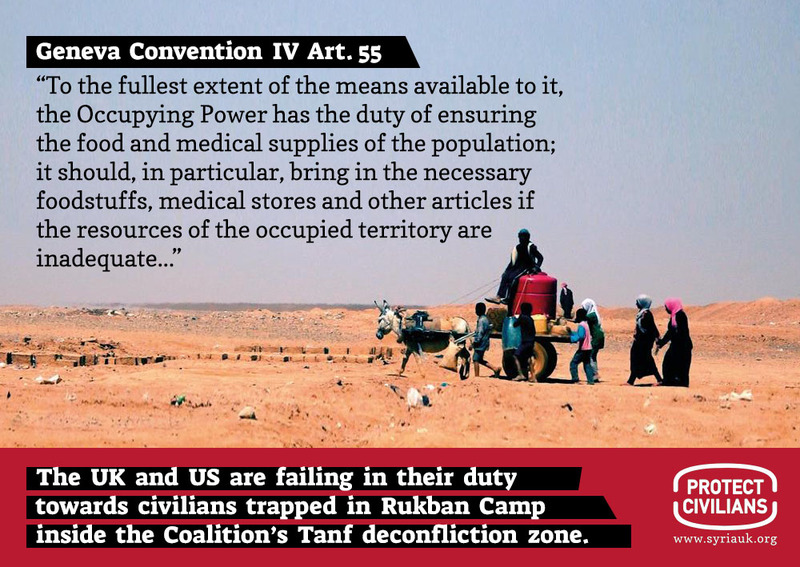 In leaving civilians in Rukban dependent on aid deliveries from Damascus, the UK and US governments and military forces are failing in their legal duty to civilians inside the Tanf zone. Call on the UK government to airlift aid to the Tanf zone. Bring the White Helmets to Rukban camp to help deliver food and medical aid. End the Coalition’s shameful and illegal dereliction of duty towards civilians. On the basis of their work with Syrian and other refugees, they have written about their serious concerns regarding certain provisions of the Counter Terrorism and Border Security Bill 2018, in particular those stipulating the proposed ‘Designated Area Offence’. 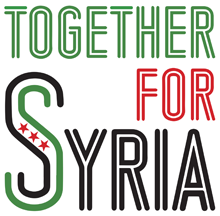 There has been a lack of engagement and consultation with the charity sector in general and the Syrian community in particular regarding the drafting of this proposed offence within the Bill, despite that these two communities will be directly affected by the Bill’s application. Rethink Rebuild are concerned that parts of Syria or Syria itself may become a designated area should this law be passed, and that the proposed offence does not sufficiently acknowledge in detail that there are valid reasons (completely unrelated to terrorism) why individuals may travel to ‘designated areas’. Read a submission on the bill by Rethink Rebuild here (PDF). Video: Trailer for ‘The People Of No Man’s Land,’ a short documentary on Rukban camp by Daham Alasaad. At least 55,000 people are at risk in Rukban Camp on the border with Jordan, according to medical organisation UOSSM. The Times reports that Rukban holds between 45,000 to 60,000 people who have fled Assad and ISIS. According to community workers, 15 people have died this month alone, among them two babies. On October 8, in the space of less than 24 hours, two babies died in the camp. 4-month-old Huda Raslan died from malnutrition and lack of medical access. Munaf Al Mahmoud, a one year old baby, died due to the lack of adequate medical care. There are now 150 cases in urgent need of medical care, UOSSM reports. The UK has a direct responsibility to protect people trapped in Rukban. UK ally Jordan is blocking access for medical and food aid. 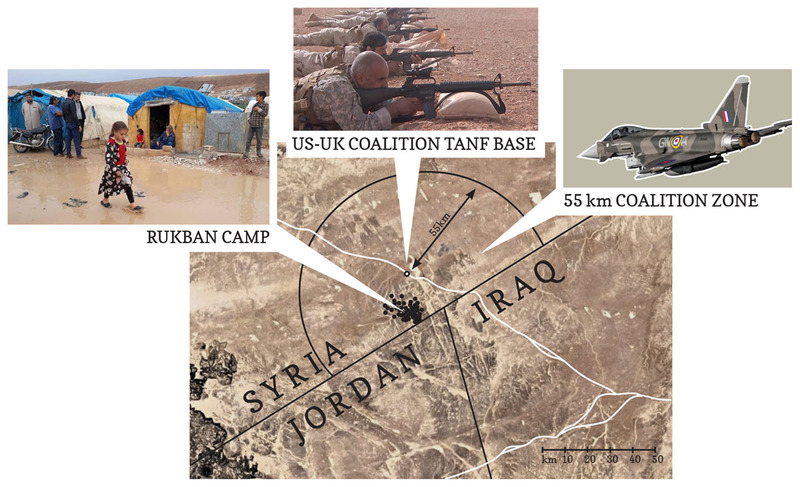 Rukban Camp is near the Coalition’s Tanf base, used by the US and by the UK’s SAS to train Syrian anti-ISIS fighters. The camp is inside a 55km deconfliction zone protected from Assad and ISIS forces by the RAF and US Air Force. As recently as June 2018, an RAF Typhoon fighter bombed Syrian regime forces that were threatening the Tanf deconfliction zone. The UK has military access to the area—in the air and on the ground. The UK has close diplomatic relations with the Jordanian government. In April 2018, DFID committed to provide £110 million of UK aid funding for 2018/19, and to double its funding for economic resilience and reform. For months and years, the UK and its allies Jordan and the US have been failing in their responsibility to protect people trapped in Rukban. 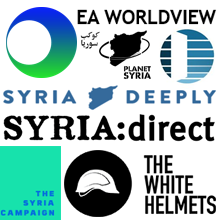 Here, even more than in other parts of Syria, the UK has the means to act, by negotiating ground access, or by implementing air access for food and medical assistance. End the UK’s shameful failure to protect people in Rukban camp. Below: Map of Rukban camp and the US-UK military base at Tanf, Map by the Carter Center via War on the Rocks.